Time to take a tour of the Moscow Metro. We’ll start with the station that I feel is the most heavily used, the most crammed and often the most frustrating: and then, when it is empty – also one of the most traditionally beautiful and ornate. This is Kievskaya- a station which was fully connected to the Metro grid in 1954 and provides commuters with access to three different lines and a train terminal. Of the three platforms, the circle line (or brown line as I often dub it) is the most ornate, with large mosaics and fancy golden decorations. 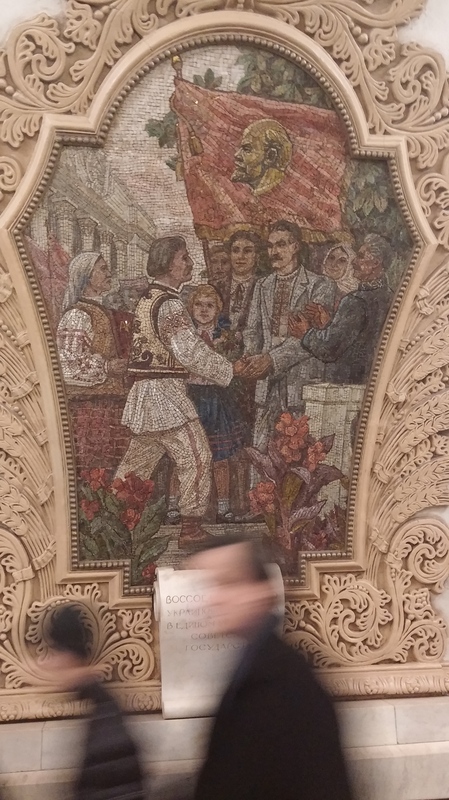 The station, as the name suggests, was built to celebrate Ukrainian-Russian unity, and the mosaics offer a variety of images on this theme, primarily showing ‘happy life in Ukraine’, as the official website describes them. Lenin presides over the hall, and therefore I have published a few images of it already (see Good Morning, Lenin!) The building itself is large, spacious, and largely made with or decorated with marble and gold. Nowadays the station is also well known for being linked to the Europa shopping centre, a large, and well-stocked mall much like you would find in any other oversized city. Outside you can not only see one of the cool glass-covered bridges that lead over the Moskva, but also two statues that are intended to symbolize the friendship between Russia and Europe, complete with all of the flags of the European Union. For me this station is notable due to the fact that it seems impossible to have all of the elevators running at the same time. As the different platforms are only connected by these elevators, passengers are usually bottlenecked and pushed along as they all attempt to squeeze onto the one functioning elevator. It’s fascinating that the maintenance on the other elevator, presumably designed to take excess people when traffic gets high, has not worked since our arrival two months ago. But, luckily for us, we’re not getting off here! Next Stop? Lets take the circle line anti-clockwise: Park Kultury. ← A Whale of a Time… a Mammoth of a Day?